Obama Reforms-"New Levels of Activism and Black Protest"
I'm sure a lot of white American's voted for Obama in the hope that electing a black president would help to reduce racial tensions in the US. Charming naivety, but naivety all the same. Unfortunately, the far leftists who put Obama into power, see his election, not as an opportunity for re-conciliation, but as a chance to move racial conflict to a higher level. Manning Marable is a key US Marxist-Leninist and long time Obama supporter. 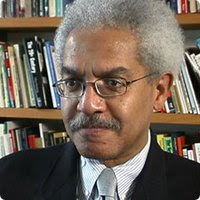 A Columbia University acadenic, Marable is a veteran of the radical New American Movement, Democratic Socialists of America, the New Party and Committees of Correspondence for Democracy&Socialism. Marable believes that the Obama movement will lead to "new levels of activism and Black protest"-even a new Black panther movement. Without question in 2007-2008 Obama's lieutenants ran a brilliant electoral campaign, wisely playing down the African American candidate's ethnic/racial identity, while linking him to the democratic civic values best represented by Franklin D. Roosevelt's New Deal, and Lyndon Johnson's Great Society. The economic crisis of 2008-2009 created an unprecedented opening promoting an agenda for democratic renewal and the incorporation of marginalized and oppressed groups into mainstreams of US civic life. Obama won the presidency, in part, because thousands of his volunteers and paid staff learned their formative political lessons inside social movements: fighting to elect Harold Washington and Jesse Jackson, opposing South African apartheid, protesting police brutality cases, defending the labor rights of poor Black workers, denouncing environmental racism. It was these social movements that gave the Obama campaign its overall, activist quality and spontaneous character. The yet unanswered question is whether the activist, militant base of "Obamaism" can be reconciled with the centrist liberalism which Obama must cleave to, in order to govern. No coherent organized left exists today in US national politics. Therefore, Obama's public policy program by necessity must be to the right of his own core constituency. Whether and how President Obama can balance these divergent forces will be a major test of his leadership. From the perspective of Black social movements, does the triumph of Obama represent a kind of "end" to Black politics? A leader of African descent, having achieved state power, has symbolically demonstrated that no fundamental barriers now exist that deny Blacks access to political power. The paradox of integration, unfortunately, is that millions of African descendant Americans remain stigmatized and excluded from employment, quality health care, education and home ownership, relative to whites. These dire conditions, combined with the continuing incidents of police brutality and the mass incarceration of young Blacks guarantee that spontaneous local protests and grassroots mobilizations of African Americans and Latinos will continue to erupt. As during the Great Society, if Obama's reforms are successfully implemented, new levels of activism and Black protest will emerge as a result. A new Black Panthers may soon be on the political horizon. So much for a new dawn in American race relations.